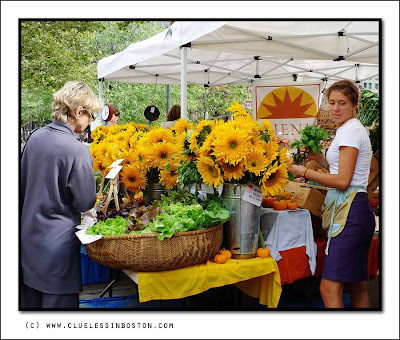 Farmer's Market at Copley Square. The sunflowers were selling for $3 each or 5 for $10. wow those sunflowers are huge! Beautiful. Some really lovely colors. For me, sunflowers mean Tuscany, just a great summer colour. I never miss a shoot of sunflowers, this is a very nice one. It's a correct price to get so much sun into a room! PS: Thank you for you kind comments all those last days! The vendor of sunflowers is a sunflower herself...a beautiful work of nature. A little bit of natural beauty to brighten up the cityscape. They certainly look worth it! Beautiful colors. I am always baffled at the price of country flowers on the markets here compare to what I see in other countries!! That's a lot for your money...they are big and bold and beautiful. Like the shot; very colorful! Beautiful! I wish I could buy one for my blue glass vase. What a cool flower market...very colorful, especially for autumn!